Explore our collection of pudding-inspired chocolates in this Christmas chocolate box. 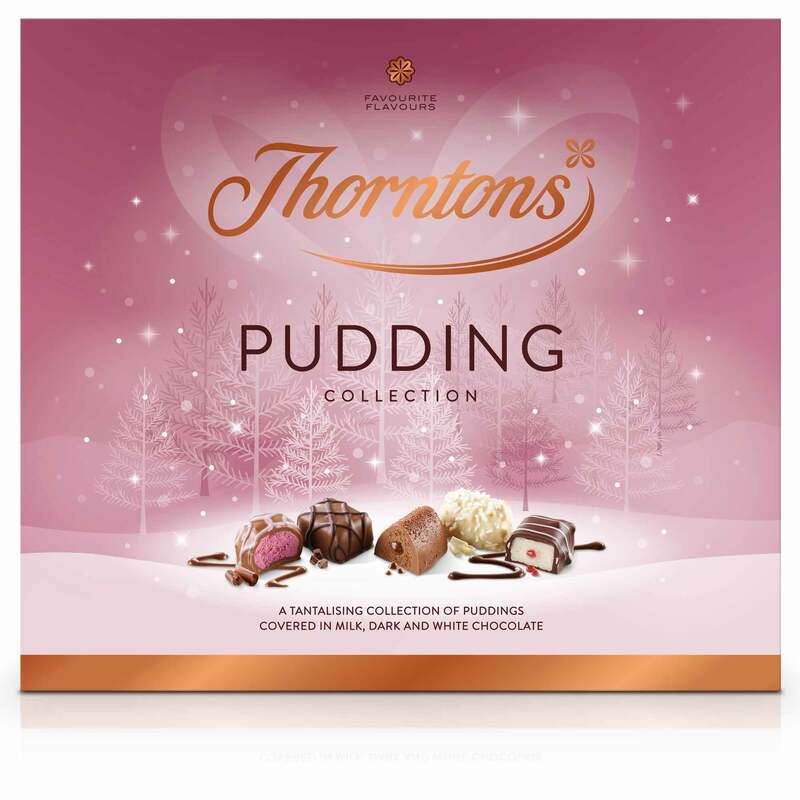 This festive exclusive is only available over Christmas and contains the spectacular Thorntons versions of some of your favourite pudding flavours. 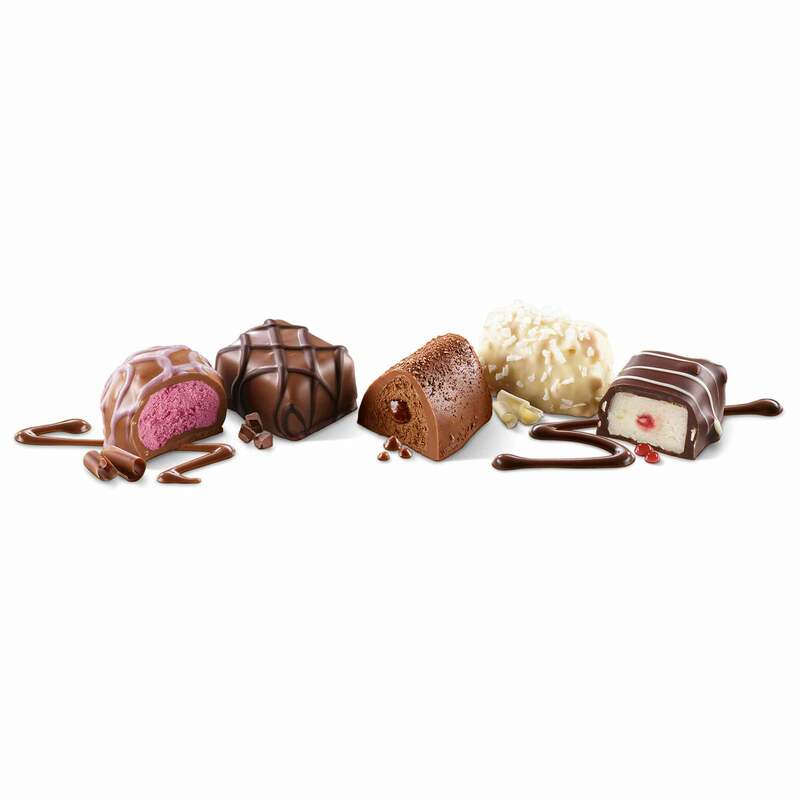 Each chocolate is full of intense flavour, reminiscent of those irresistible puddings we all love. There's a very fruity Blueberry Cheesecake, a piquant Ginger Pudding, an inviting Almond & Cherry Slice, a blissful Manchester Tart, layers of richness in the Chocolate Pudding and a delicious milk chocolate Thorntons Signature. If puddings are your thing, then this box is perfect for sharing with friends and family, or for wrapping up ready for Christmas morning. Sugar, cocoa mass, cocoa butter, dried whole MILK, glucose syrup, double cream (MILK), humectants (sorbitol, glycerol), ALMONDS, butter (MILK), palm oil, desiccated coconut, glucose-fructose syrup, MILK fat, dextrose, ginger, emulsifier (SOYA lecithin), single cream (MILK), concentrated blueberry juice, sour cherry juice, dried whey (MILK), mascarpone cheese (MILK), dried skimmed MILK, fat reduced cocoa powder, raspberry powder, whole MILK, HAZELNUTS, raspberry purée, sweetened condensed MILK (whole MILK, sugar), flavourings, concentrated raspberry juice, invert sugar syrup, lemon juice, acid (citric acid), stabiliser (invertase), colours (anthocyanins, beetroot red), thickener (pectin), salt, concentrated lemon juice, acidity regulators (sodium acetate, acetic acid), plant and fruit concentrates (spirulina, apple).